Everyone looks so cute! So many fun sunglasses. I have to add that I love your new haircut as well! Hm, show us your new haircut! I'm not super happy about mine too, probably will chop off a bit more. This looks like lots of fun! Everyone looks amazing! So much fun! Everyone looks very stylish. wow gorgeous girls!!! :) Bloggers meetups are just the best!! I bet that was amazing, everyone is so impossibly chic! I swear, blogger meet ups are the place to find the most fashionable and lovely bunch of girls ever! You all are so stylish! 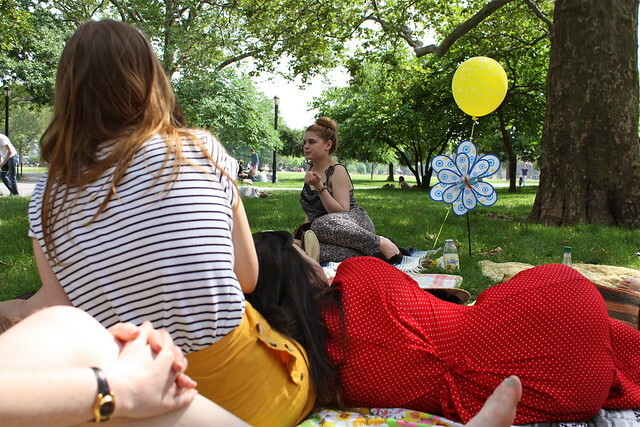 I would love to go to a blogger meetup in the park! Oh my, everyone looks so fabulous! I wish I could of made it. I had planned on it but then a bunch of stuff got in the way. ): I'll make it down there one of these days. you are too cute. it was so great to meet you! not gonna lie, we were talking about how amazing your hair is after the meet up was over. you make me want to cut all of mine off! How I would have love to have been there. I was stuck in the Barbados airport for hours waiting on a plane the was eventually cancelled. Lovely pics and looks like you had a grand old time!